Dr. Jon Marc Van Slate is dedicated to providing his patients with the best-possible care. As part of this commitment, he proudly offers a range of laser dentistry treatments at his Houston, TX, practice. We can use our state-of-the-art diode laser to treat gum disease or ulcers, correct aesthetic concerns, and much more. When compared to using traditional metal scalpels, lasers allow for less discomfort and faster healing times. To learn more about our laser dentistry services, schedule a consultation with Dr. Van Slate today. 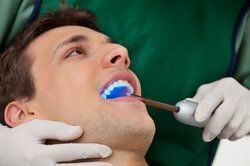 If we diagnose you with a moderate case of gum disease, we can use our laser to eliminate bacteria, treat periodontal pockets, and reduce biofilm that has collected on teeth. The length of your procedure will depend upon how much gum tissue is being treated. When compared to the traditional approach, laser periodontal therapy is less invasive and more accurate. A dental crown is used to repair a damaged or badly decayed tooth. If excess gum tissue is preventing the placement of a crown, crown lengthening can be used to create sufficient space by exposing more of the tooth's surface. We perform oral cancer screenings as a part of routine examinations in order to help protect the overall health of our patients. When we do spot any abnormal growths that may indicate the presence of oral cancer, we will typically recommend a biopsy. During this procedure, we will use our laser to take a small tissue sample. The sample will then be analyzed so that we can make an accurate diagnosis. When compared to using traditional metal scalpels, lasers allow for less discomfort and faster healing times. Mouth ulcers — also referred to as canker sores — are small lesions that develop on oral tissues. Patients with mouth ulcers can experience pain when eating, speaking, or brushing. Rather than using a blade, Dr. Van Slate can effectively remove mouth ulcers with our diode laser. The upper and lower lips are connected to the gum line by small folds of tissue known as frenulums. Some patients have overly large frenulums that can interfere with speech. In these cases, we can use our laser to perform a frenectomy, which is the surgical removal of a frenulum. When gum tissue extends too far down teeth, it can detract from the beauty of a smile and leave a patient feeling self-conscious. In addition, it can also make it more difficult to properly care for teeth through brushing and flossing. Laser gum contouring is performed to bring uniformity to an uneven gum line. During this procedure, Dr. Van Slate will create a beautiful frame for your smile by carefully removing excess gum tissue. The laser will seal tissues as it cuts, so there are no stitches required. At Dr. Van Slate's dental practice, we combine advanced technology with a compassionate and personalized approach. To learn more about how you can benefit from a laser dentistry treatment, contact a member of our friendly staff today.